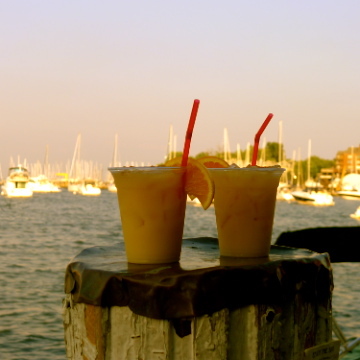 Be sure to see the sunset in Cefalù! 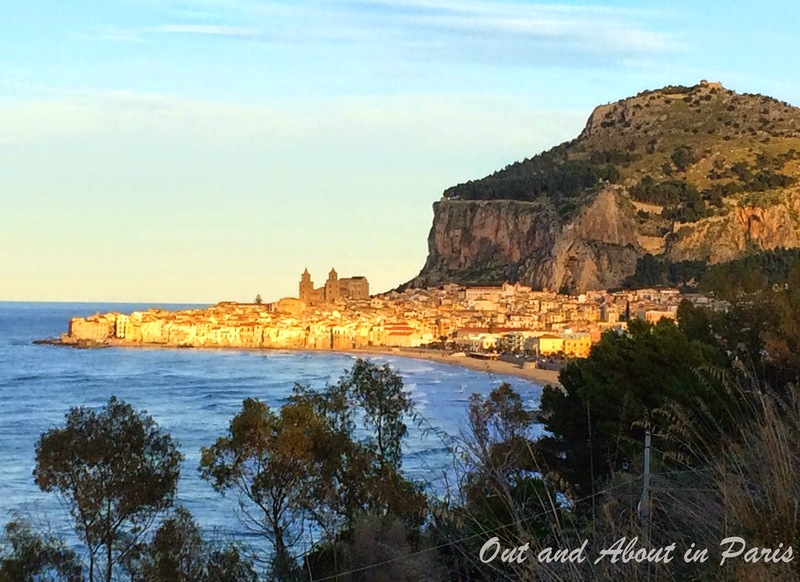 With honey-colored buildings lining its crescent-shaped beach, Cefalù is the kind of place that immediately comes to mind when people dream about a Mediterranean vacation. While the majority of tourists flock to this medieval town to soak up the sun during the summer months, I would venture to say that it's narrow cobblestone streets are at their most picturesque when they're brightly illuminated for Christmas. The decorated palm trees cast a festive glow on the piazza in front of the magnificent cathedral built during the twelfth-century reign of Norman King Roger II. In the Arab-Norman style unique to Sicily, the cathedral's "Christ All Powerful" mosaic above the altar is the focal point of Sicily's oldest and best preserved Byzantine mosaics. They predate those of the Monreale Cathedral by 20 or 30 years. 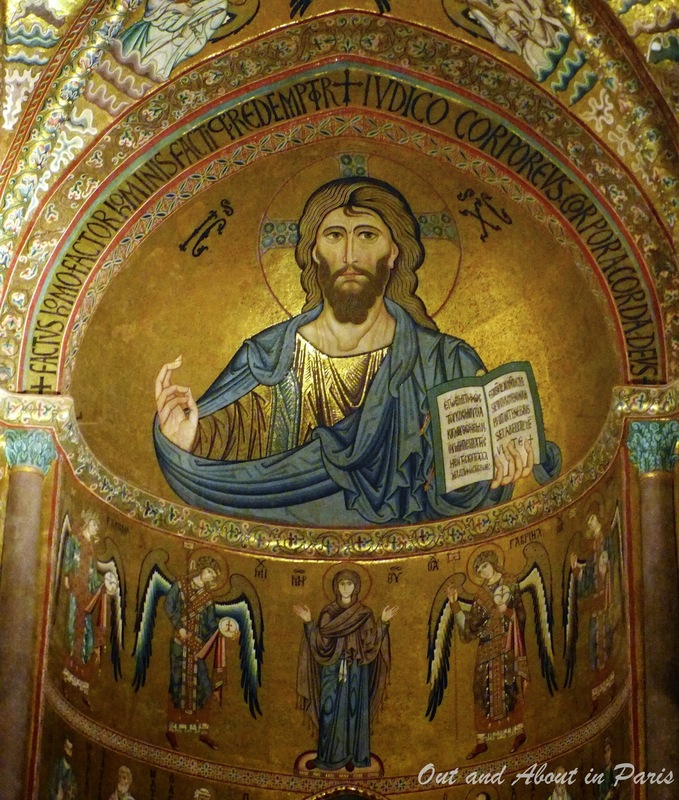 "Christ All Powerful" 12th-century mosaic in Cefalù's cathedral. In a playful mood, Sara and Philippe got down on their knees and pretended to be washerwomen at the medieval lavatoio. Located in what was supposedly King Roger II's private residence, the washhouse is fed by water from the Cefalino River. A plaque on the right-hand side of the washhouse reads: "Here flows Cefalino, healthier than any other river, purer than silver, colder than snow." Until only a few decades ago, the washhouse was still used by the town's women. 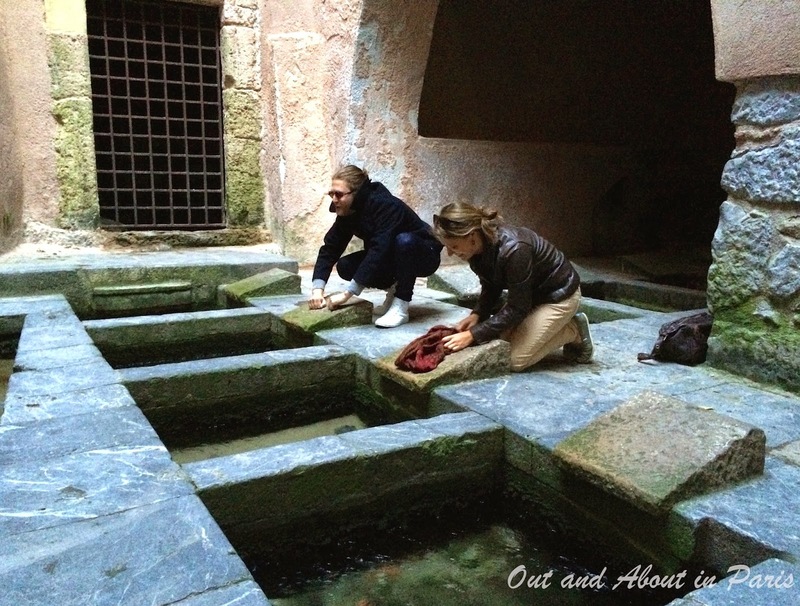 Philippe and Sara hard at work at the medieval washhouse (lavatoio) in Cefalù. If you would like to prepare for your trip, parts of director Giuseppe Tornatore's much-loved film Cinema Paradiso are set in Cefalù. Only one hour by car or train from Palermo, this picturesque seaside town is well worth the trip! 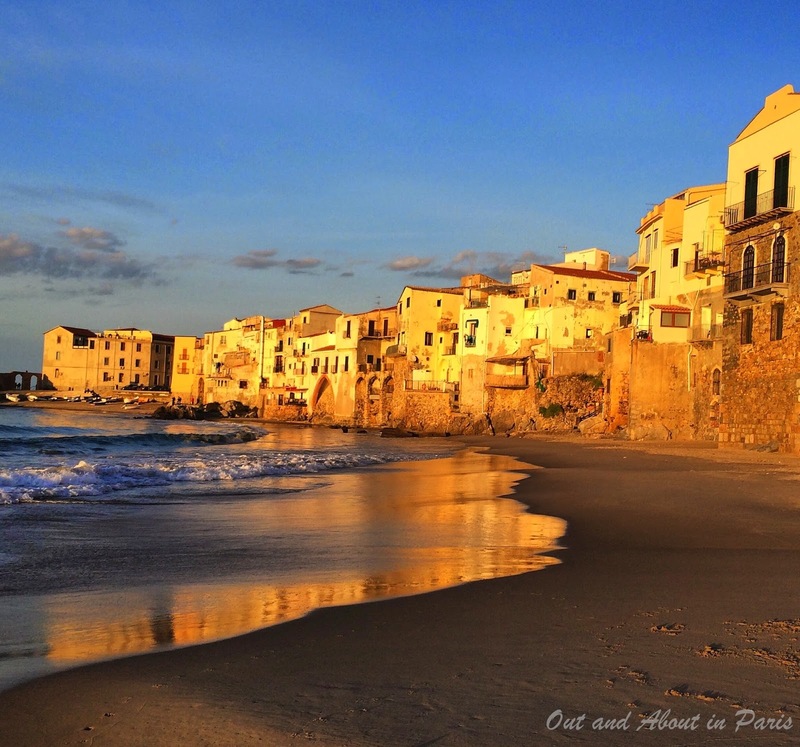 Cefalù's name derives from the ancient Greek word for "Cape". I love the pretend washing being done, so cool that it's still there! Bridget, Sara really got into her role as a washerwoman! She even took off her scarf so that she would have a prop. Seeing Sara and Philippe at "work" made me happy to have a washing machine and dryer. Glad that you managed to get here.... and that my suggestion was not a failure! Nancy, Your suggestion was a huge success! 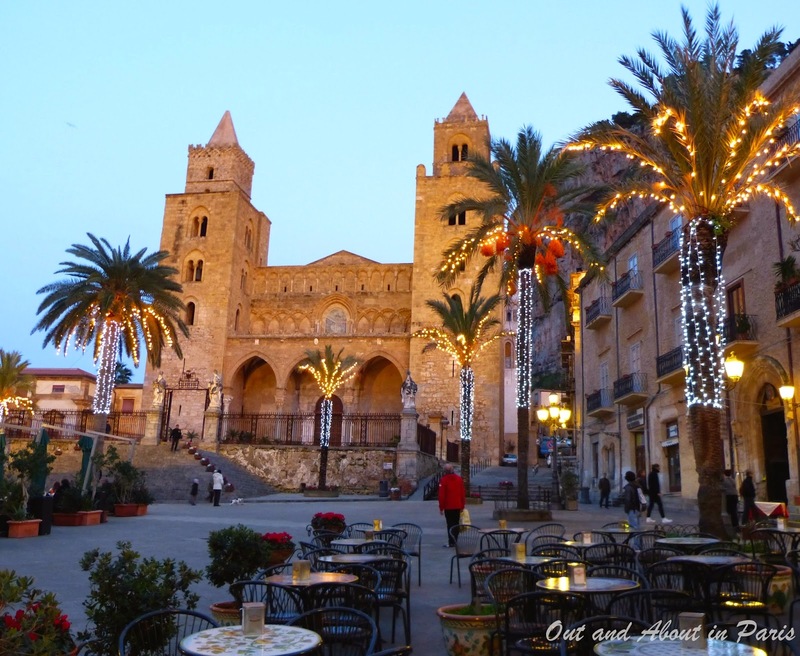 Thanks again for recommending that we go to Cefalù.